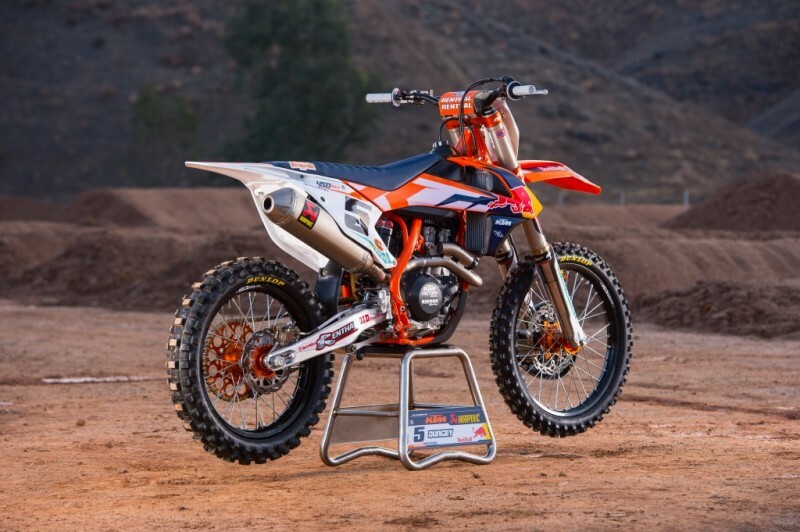 In 2015, Ryan Dungey once again contested the KTM 450 SX-F Factory Edition, which has been specifically produced for the Supercross championship. 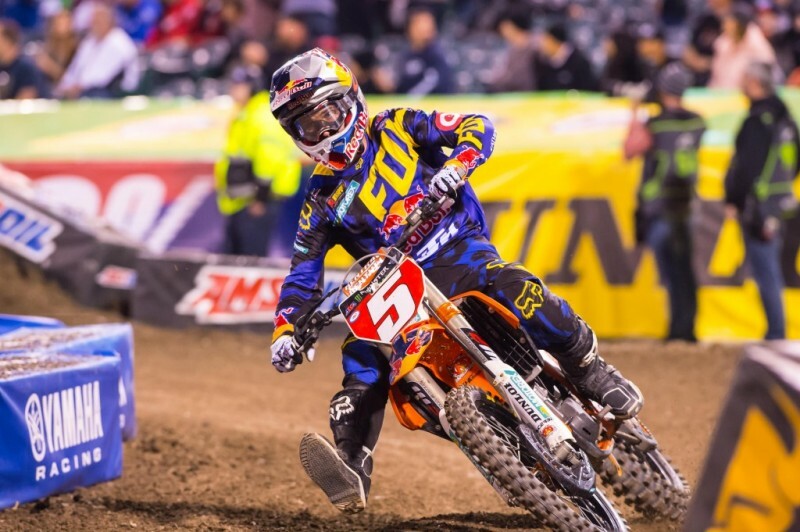 In front of an enthusiastic crowd the 2015 Supercross season started off with the first race in Anaheim. 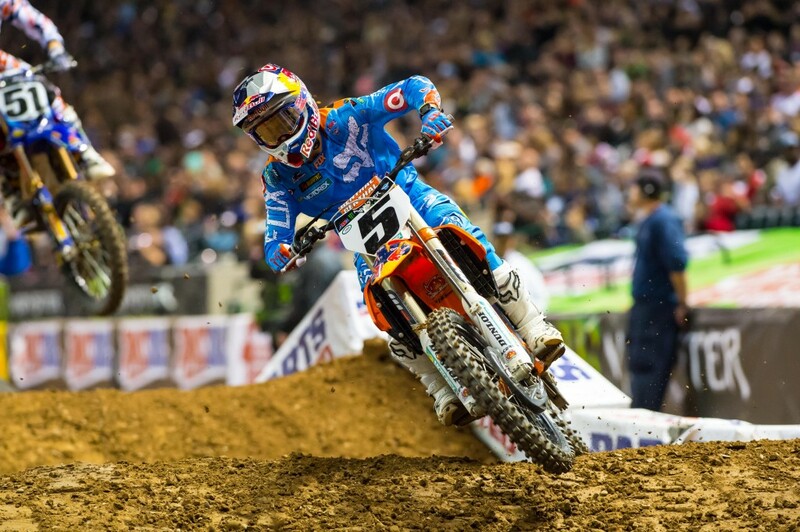 After finishing 2nd in the 2014 Supercross championship, Dungey had the title in his sights for 2015. A solid 4th place in the season opener was definitively not the worst start into the year. 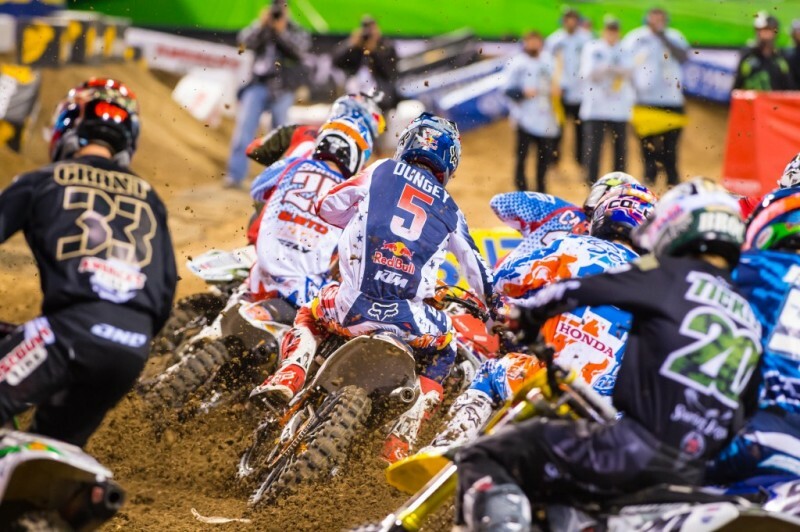 Already in Round 2 of the championship held at Chase Field in Arizona, Dungey earned his first podium finish of the season. With the points gained by his 3rd place he moved into 2nd place in the overall points standings. 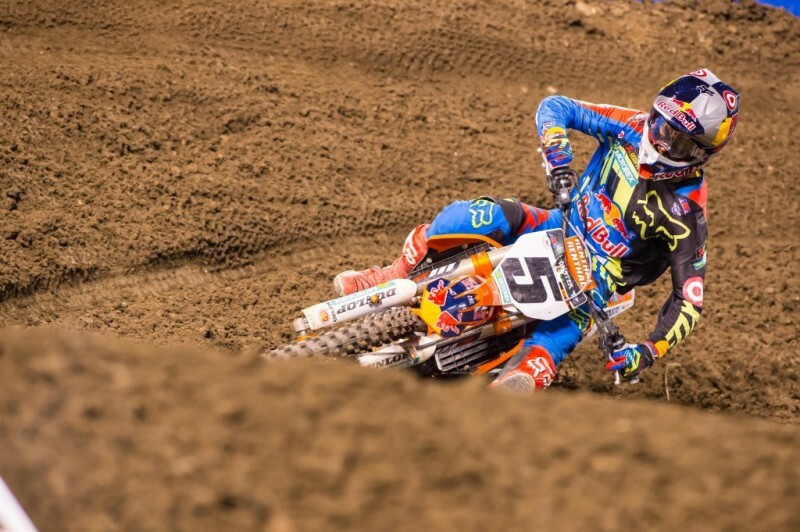 At the second race in Anaheim held at Angel Stadium, Dungey earned a 2nd place. His best finish of the season helped him to step closer to the top spot in the overall standings. 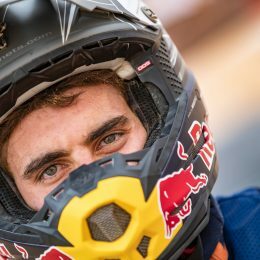 Although Ryan Dungey couldn´t record a win in the first four rounds of the championship his consistent results paid off. His 2nd place podium finish at the Oakland Coliseum moved him to the 1st place overall in the championship standings by five points. 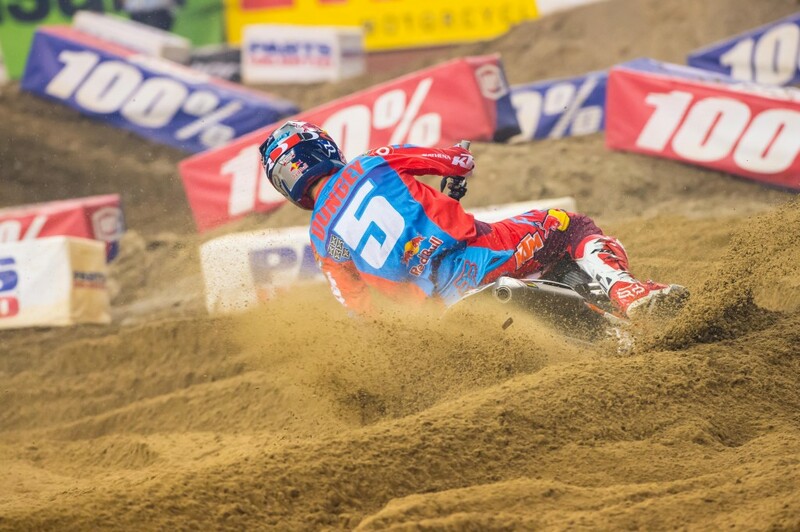 At the third race in Anaheim held at the Angel Stadium Ryan Dungey had a storybook day. 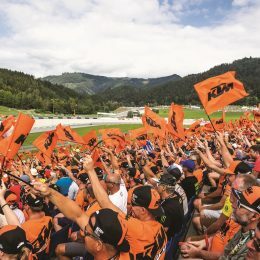 After he moved into the overall points lead after the completion of Round 4, Dungey rode with the Red Plate – obviously a sign of good luck as he gained his first win of the season and extended the overall points lead. 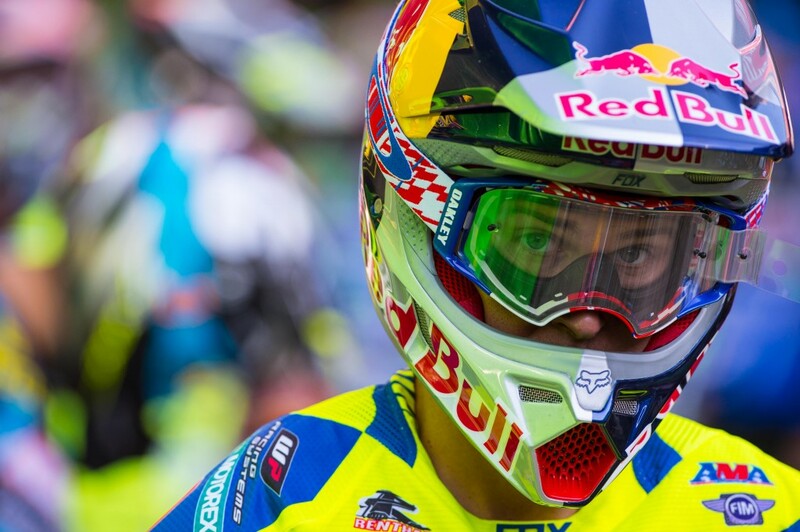 After an eventful and hard-fought race Ryan Dungey earned an impressive 3rd place finish at San Diego´s Petco Park. His podium finish allowed him to remain leader in the standings. 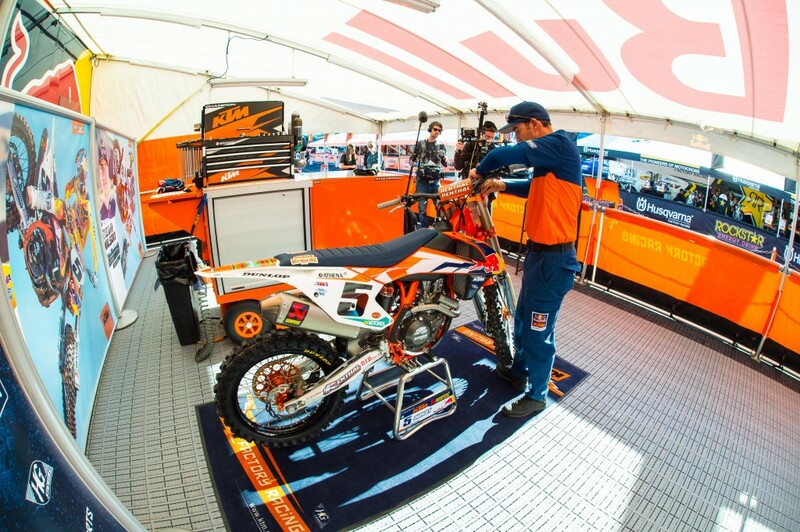 In Texas it became an exciting night for the Red Bull KTM Factory Racing Team. While Dungey earned his second win of the season leading from start to finish and extending the championship lead to twelve points, his teammate Marvin Musquin took the win in the opening round of the East 250SX championship – only the first of several KTM double wins. 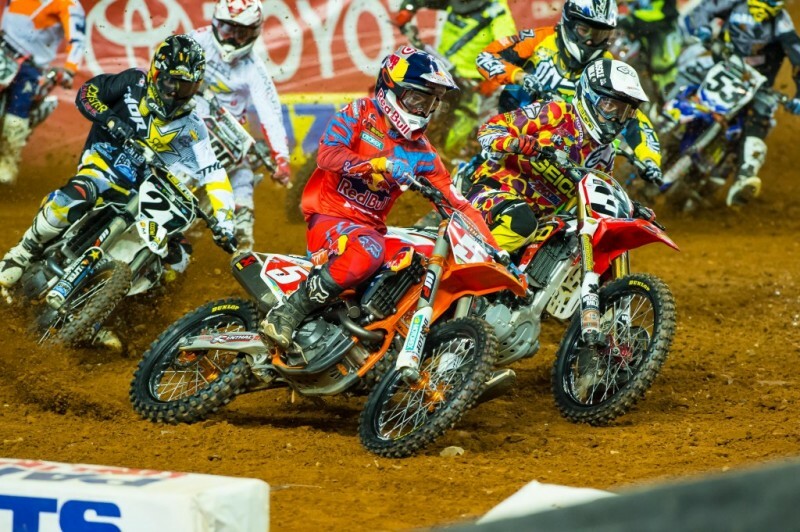 In Atlanta Ryan Dungey rode to a 2nd place finish and further extended his lead in the championship to 25 points. 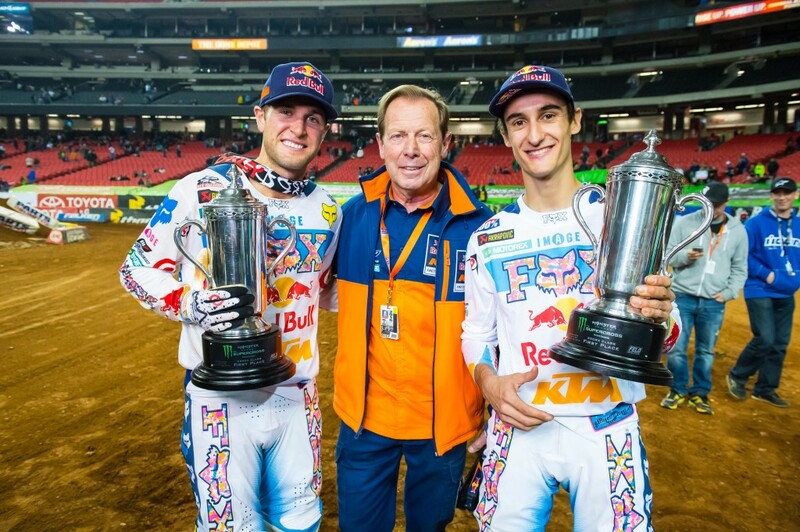 The races at the Georgia Dome in Atlanta marked the beginning of what should become an impressive winning streak for the Red Bull KTM Factory Racing Team. 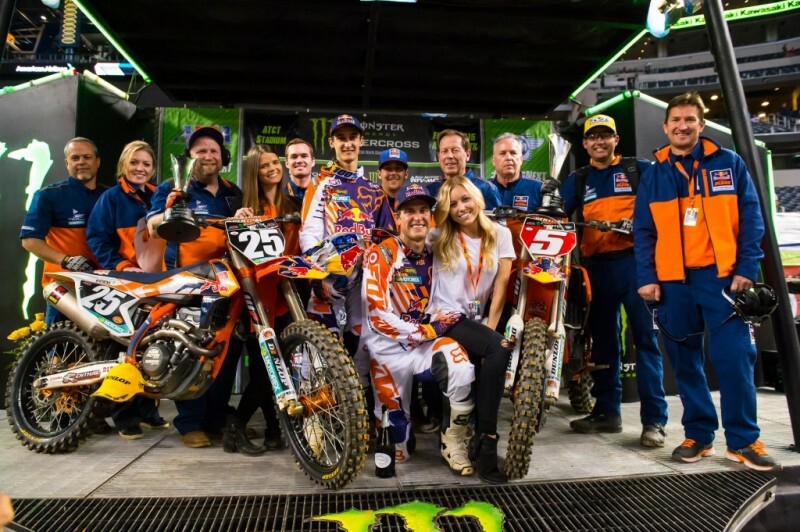 Dungey celebrated a superior third season victory which extended the championship lead to 30 points, while his teammate Musquin took an equally dominating win in the East 250SX class. The two riders even managed to continue this run for two more races. In reward for a hard-fought race Dungey earned his first-ever career Daytona Supercross victory which was celebrated with burnouts and high fives for the fans. In the standings Dungey was already 40 points ahead of his closest competitor. 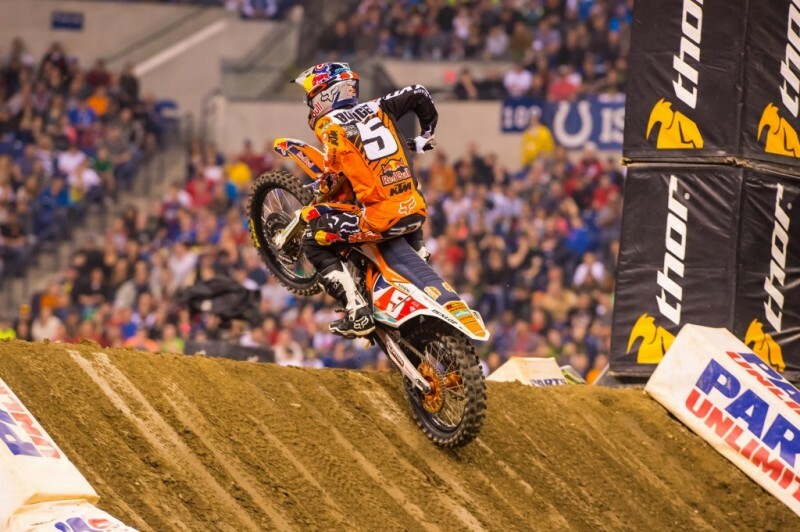 Matching his number, in Indianapolis Dungey gained his fifth victory of the season that completed a series of three consecutive race wins and helped him to extend his championship lead to 45 points. 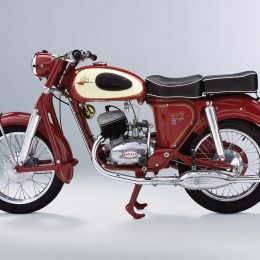 Of course the goal is to win each race, but sometimes – particularly in the final stages of the season – it´s even more important to ride a safe race and collect as much points as possible. After gaining the holeshot and leading the first heat from start to finish, Dungey rode a smart and mistake-free second heat to finish in 2nd place and leave the Motor City Detroit with a 67 point lead in the championship chase. At the Edward Jones Dome in St. Louis Ryan Dungey earned his sixth win of the season and stretched his championship lead to 80 points. True to the wisdom “Behind every great man there is a great woman” Lindsay is always on site to encourage and support her husband. 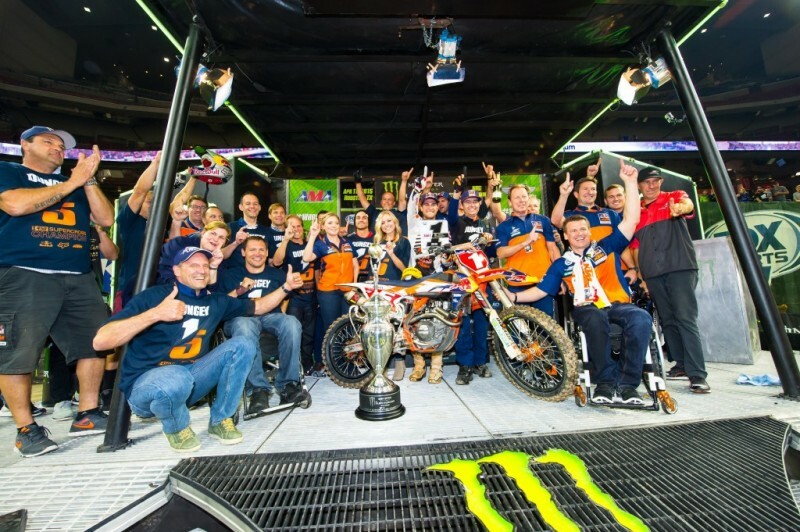 With three races to go in the 2015 Supercross season, Ryan Dungey was crowned Supercross World Champion in Houston and thereby secured the first-ever 450 Supercross title for KTM!